Gareth Bale lead Real Madrid as Los Blancos came from two goals behind against Rayo Vallecano on Saturday. A brace from the Welshman and a goal from Lucas Vazquez earned the visitors all three points. 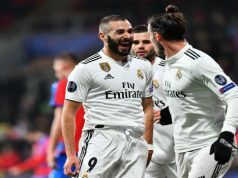 Zinedine Zidane men put in an impressive performance in the second half to move top of the La Liga table, although Barcelona and Atletico Madrid are yet to play their match this weekend. Los Merengues had a poor start and conceded two goals before the 15-minute mark. Yet, Bale was close to making it 0-1 in the third minutes as he hit the post with a powerful effort from the edge of the box. 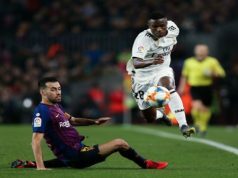 Rayo made the breakthrough in the seventh minute as Bebe drove down the left before sending a low cross into Adrian Embarba, who fired home from close range. The hosts made it 2-0 as Miku smashed the ball home from close range following some poor defending from Los Blancos in a corner kick. The hosts came close to making it 3-0 as Embarba found himself facing Keylor Navas with no defenders around. However, some smart goalkeeping from Keylor Navas saved Real. Ten minutes before the break, Bale gave his team hope as he headed a Toni Kroos corner past Juan Carlos Martin to make it 2-1. 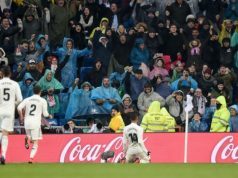 Real improved in the second half and managed to level after seven minutes as Lucas Vasquez headed a super Danilo cross into the back of the net. Bale completed the turnaround with ten minutes to go following a terrible mistake from Embarba, who sent the ball straight at the Welshman. The Los Blancos forward drove away from Amaya and found the bottom corner with a low strike.